Rating tools: Did you know? Rating tools are not the be all and end all of sustainable building, but they go a long way towards guiding architects and developers in creating greener cities and providing a benchmark. In this article we take a look at a fairly new residential rating tool rolled out by the Green Building Council South Africa (GBCSA), as well as a tool that will soon be used to guide the development of green precincts. The EDGE (Excellence in Design for Greater Efficiencies) residential green building tool drives the residential property market to design and build resource-efficient homes and determines the financial viability of a project’s green potential and the potential utility bill savings in operation. The EDGE rating requires achieving savings of 20% in each of the three categories: operational energy and water usage and a reduction in the embodied energy of materials used in the project’s construction. EDGE is a global rating system and the software has been localised to South Africa to accurately calculate the building’s energy, water and materials performance, based on South African data related to building regulations and practices, climate and utility costs. Create a user profile using free EDGE online software and do a self-assessment. Register your project for certification and pay the fee to the GBCSA. Contract with an AP for compliance with EDGE requirements. Rely on the EDGE AP to submit your application to the GBCSA. Receive an EDGE certificate for your project from the GBCSA. Enable the financial foundations from which greener homes are built. • Benchmark and secure future value in green homes. Open the doors to new standards in green homes. • Simplicity in creating green homes. • Unlock new green markets. Shape the view of and demand for green homes. • Savings in living costs. • Increase choice and home value. Create the enabling policies that drive green homes. The EDGE rating tool was launched in South Africa at the end of 2015 and the residential sector has shown an uptake of green homes with 8 293 homes having been registered with the GBCSA to target EDGE certification and the first 323 homes fully certified (see attached press release). 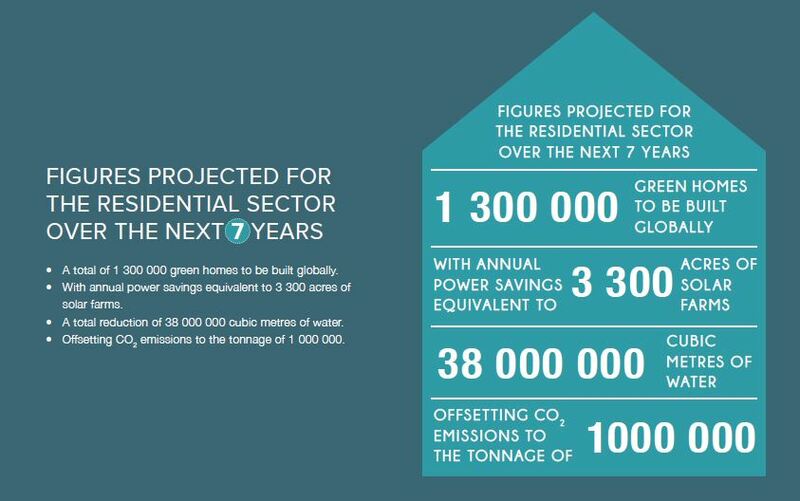 According to United Nations (UN) statistics, 77% of people in Africa will be living in cities by 2063, which means the impact to be made by new green residences is significant. The EDGE rating was created by the International Finance Corporation (IFC) with the aim to transform 20% of new residential and commercial buildings in rapidly-industrialising countries within the next seven years, led by local green building councils and global certification providers. Soon to be launched, a brand new tool in the Green Star suite – the “Sustainable Precincts rating tool” – aims to enhance the liveability of precincts and create opportunities for economic prosperity, foster environmental responsibility, embrace design excellence, and demonstrate visionary leadership and strong governance. The Australian Communities tool is taken as the basis for the implementation of Sustainable Precincts in South Africa. A Local Context Report (LCR) is prepared to put the credits into South African perspective. Solid Green, the Technical Consultant for the GBCSA has led this process and finalised the report in March 2017. A technical advisory panel of 35 industry professionals have assisted in the development of this LCR. Fourteen PILOT project have tested the tool, applying the criteria and providing feedback to the LCR process. Eight of these have committed to certification using this tool, targeting either a 4, 5, or 6-star rating. How does the tool look? Very different from previous Green Star SA tools, this one is more holistic. It has four categories (Governance, Economic Prosperity, Liveability and Environment) with a minimum number of points required in every category, so that project teams have to find a balance across the project instead of just focusing on one or two areas. – Campuses and business parks. 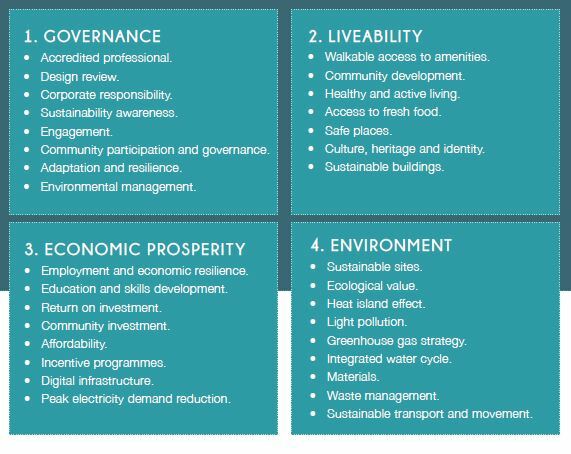 Apart from providing a clear roadmap of how a sustainable precinct should be developed, there is also a range of benefits for the different stakeholders. The government will get the opportunity to demonstrate its commitment to the long-term sustainability and prosperity of communities and to engage with community stakeholders on sustainable growth. Private sector confidence will improve as credibility is assured through third-party verification. This tool will also help to reduce the cost of delivering and maintaining infrastructure. Developers, in turn, will attract investments by demonstrating sustainability, which can give them the competitive advantage. There is an opportunity for accelerated approvals, reduced infrastructure charges and holding costs, which will enhance long-term project potential. In addition, they will upskill their teams, build a stronger corporate social investment image and provide a lasting legacy. Consultants can demonstrate green leadership that differentiates them in the market and creates new business opportunities. Finally, consumers will enjoy healthier environments, well-designed and connected spaces which reduce their ecological footprint. Full thanks and acknowledgment are given to the Green Building Council South Africa and Solid Green Consulting for the information provided to write this article.